Glucose plays two distinct roles in regulating insulin secretion from beta cells—an initiatory role, and a permissive role enabling receptor-operated secretagogues to potentiate glucose-induced insulin secretion. The molecular mechanisms underlying the permissive effects of glucose on receptor-operated insulin secretion remain uncertain. We have investigated the role of extracellular signal-regulated kinase 1/2 (ERK1/2) activation and consequent cytoskeletal remodelling in this process. Insulin release was measured from groups of isolated mouse islets using static incubation experiments and subsequent radioimmunoassay of samples. ERK1/2 activation was measured by western blotting of islet protein samples for both phosphorylated and total ERK1/2. Rhodamine–phalloidin staining was used to measure filamentous actin in dispersed primary beta cells. Inhibition of ERK1/2 blocked potentiation of glucose-induced insulin release by the receptor-operated secretagogues kisspeptin, A568, exendin-4 and JWH015, although the agonists alone had minimal effects on ERK1/2 activation, suggesting a permissive rather than causal role for ERK1/2 activation in receptor-operated insulin release. Following pharmacological activation of ERK1/2 all agonists caused a significant increase in insulin release from islets incubated with sub-stimulatory levels of glucose. ERK1/2 inhibition significantly reduced the glucose-dependent decreases in filamentous actin observed in primary beta cells, while pharmacological dissociation of actin filaments enabled all receptor-operated secretagogues tested to significantly stimulate insulin release from islets at a sub-stimulatory glucose concentration. Glucose-induced ERK1/2 activation in beta cells mediates the permissive effects of stimulatory glucose concentrations on receptor-operated insulin secretagogues, at least in part through effects on actin depolymerisation and cytoskeletal remodelling. Secretion of insulin from pancreatic beta cells is the result of complex interactions between nutritional and hormonal signals. Elevated plasma glucose levels comprise the primary physiological stimulus for initiating insulin secretory responses by inducing depolarisation-dependent elevations in intracellular Ca2+. Insulin secretion is also regulated by a wide range of receptor-operated secretagogues, including neurotransmitters and hormones, although the majority of receptor-operated secretagogues potentiate glucose-induced insulin release rather than initiating insulin release per se, presumably to avoid inappropriate secretion of insulin under normoglycaemic conditions. Glucose therefore plays two distinct roles in regulating insulin secretion from beta cells: a Ca2+-mediated initiatory action, and a permissive role enabling receptor-operated secretagogues to potentiate insulin secretion . The intracellular signalling pathways through which glucose initiates the exocytosis of insulin secretory vesicles from beta cells are fairly well understood, but the mechanisms underlying the permissive effects of glucose on receptor-operated insulin secretion remain uncertain. Glucose-induced increases in intracellular Ca2+ have been reported to activate various kinases within beta cells  including protein kinase C (PKC), protein kinase A (PKA), calmodulin kinase II (CAMKII) and extracellular signal-related kinase 1/2 (ERK1/2) (also called p42/44 mitogen-activated protein kinase [p42/44 MAPK]) [3, 4, 5]. ERK1/2 are serine/threonine kinases that form an integral component of an intracellular signalling cascade primarily involved in cell proliferation and growth-promoting effects via upregulation of nuclear transcription factors . Physiological concentrations of glucose activate ERK1/2 in pancreatic beta cells [3, 7] and glucose-activated ERK1/2 have been shown to upregulate insulin mRNA levels  and may play a role in regulating insulin secretion . The potential role of ERK1/2 in receptor-operated insulin secretion has been less well documented [9, 10, 11, 12]. Several secretagogues, including the endogenous G-protein coupled receptor 54 (GPR54) ligand kisspeptin and the calcimimetic activator of the calcium-sensing receptor A568, have been identified as requiring ERK1/2 activation to potentiate glucose-induced insulin release [10, 12], while the potentiating effects of other secretagogues, including glucose-dependent insulinotropic peptide (GIP) and oxytocin, do not appear to require ERK1/2 activation . In this study we investigated whether ERK1/2 activation may be permissive for the potentiation of glucose-induced insulin secretion by receptor-operated secretagogues. In other tissues, Ca2+-induced exocytosis has been linked to ERK1/2-dependent depolymerisation of the actin skeleton, enabling vesicles to access the exocytotic sites on the inner surface of the plasma membrane . In beta cells, filamentous F-actin forms a web below the plasma membrane that is thought to restrict access of insulin secretory vesicles to the cell surface . It has been suggested that glucose-induced increases in intracellular Ca2+ result in the transient depolymerisation of the F-actin web, increasing exocytosis . Little is known about the mechanism(s) through which ERK1/2 activation may influence receptor-operated insulin release, although in other cell types, such as adrenal chromaffin cells, receptor-operated secretagogues have been shown to increase exocytosis through ERK1/2 activation and subsequent F-actin depolymerisation . A link between actin depolarisation and exocytosis is therefore well established, as is a link between ERK1/2 activation and cytoskeletal remodelling. The second aim of the present study was therefore to determine whether glucose-induced ERK1/2-dependent cytoskeletal remodelling mediates the permissive effects of glucose on receptor-mediated insulin secretion. All experiments involving animals were approved by the local ethics committee. Mouse kisspeptin-10 was synthesised by Alta Biosciences (Birmingham, UK). The calcimimetic A568 was from Amgen (Thousand Oaks, CA, USA). The cannabinoid receptor 2 agonist JWH015 was from Tocris Bioscience (Bristol, UK). The inhibitors of actin polymerisation, latrunculin B and cytochalasin B, and the mitogen-activated ERK kinase (MEK) inhibitor PD098059 were from Calbiochem (Nottingham, UK). PD98059 was dissolved in DMSO such that the final DMSO concentration in incubation buffers was 0.1% (vol./vol.). The relevant controls received 0.1% DMSO alone. The glucagon-like peptide 1 (GLP-1) analogue exendin-4, collagenase, FCS, glutamine, penicillin/streptomycin, carbachol, okadaic acid, sodium pervanadate and guinea pig anti-insulin antibody were from Sigma (Poole, UK). RPMI and DMEM were supplied by Invitrogen (Paisley, UK). The antibodies against total ERK1/2 (1:2,000) and against phosphorylated (phospho-)ERK1/2 (1:2,500) were obtained from Promega (Southampton, UK). Rhodamine–phalloidin was from Cambridge Bioscience (Cambridge, UK). The pCA-MEK plasmid and the MEK1 pBabePuro plasmid were kind gifts from T. Herbert (Department of Cell Physiology and Pharmacology, University of Leicester, Leicester, UK) and C. Marshall (Division of Cancer Biology, Institute of Cancer Research, London, UK), respectively. Nucleofector II and Lipofectamine 2000 were from Amaxa (Cologne, Germany). Islets of Langerhans were isolated from male ICR mice (Harlan, Bicester, UK) by collagenase digestion of the exocrine pancreas and incubated at 37°C in RPMI (supplemented with 10% [vol./vol.] FCS, 2 mmol/l glutamine and 100 U/ml penicillin/0.1 mg/ml streptomycin) for at least 24 h before use. The effects of treatments on insulin secretion from mouse islets were assessed using static incubations of islets. Islets were pre-incubated for 1 h in RPMI containing 2 mmol/l glucose. Groups of three islets were transferred into 1.5 ml microcentrifuge tubes and incubated at 37°C for either 30 min or 1 h in a bicarbonate-buffered physiological salt solution as described by Gey and Gey (0.6 ml, 37°C, ) containing 2 mmol/l glucose, 2 mmol/l CaCl2 and 0.5 mg/ml BSA supplemented with agents of interest. After 30 or 60 min samples of the incubation medium were taken and stored at −20°C until assayed for insulin content using an in-house radioimmunoassay . Islets were cultured overnight in serum-free RPMI (supplemented with 2 mmol/l glucose, 2 mmol/l glutamine and 100 U/ml penicillin/0.1 mg/ml streptomycin). Groups of 200 islets were incubated (37°C, 5 min) in a physiological salt solution containing either 2 mmol/l or 20 mmol/l glucose in the presence or absence of agonists, cooled and then pelleted by centrifugation (10,000 g, 1 min). The supernatant fraction was discarded and protein extracts were prepared as described . Proteins were separated by PAGE, transferred to membranes and immunoprobed for ERK1/2 and for phospho-ERK1/2 (i.e. activated ERK1/2), as described previously . These experiments have been performed on mouse MIN6 beta cells as they are a well-established physiological beta cell model that allows efficient transfection with constructs. MIN6 beta cells were maintained in culture at 37°C in DMEM (25 mmol/l glucose) supplemented with 2 mmol/l glutamine, 10% FCS, 100 U/ml penicillin and 100 μg/ml streptomycin. Transient transfection of MIN6 beta cells was achieved by electroporation using a Nucleofector II electroporation machine as previously described , with a transfection efficiency of 50–75% as determined through co-transfection with a gfp-expressing plasmid. MIN6 beta cells were transfected with two different plasmids in Lipofectamine 2000 transfection reagent, each producing a constitutively active MEK mutant. Both plasmids have been previously described; the pCA-MEK plasmid (plasmid A) was a gift from T. Herbert  and the MEK1 pBabePuro plasmid (plasmid B) was a gift from C. Marshall [21, 22]. MIN6 beta cells were then seeded into either 96-well plates for insulin-release experiments or tissue culture flasks for protein extraction, and were maintained in culture for 48 h. Protein extracts were prepared from cells maintained in flasks and activation of MEK determined by western blotting. For insulin-release experiments, cells in 96-well plates were pre-incubated for 1 h in DMEM containing 2 mmol/l glucose. Cells were then incubated at 37°C for 30 min in bicarbonate-buffered physiological salt solution (0.6 ml, 37°C, ) containing 2 mmol/l glucose, 2 mmol/l CaCl2 and 0.5 mg/ml BSA supplemented with agents of interest. Samples of the incubation medium were taken, stored at −20°C and assayed for insulin content at a later date. Isolated mouse islets were dispersed into single cells using EDTA (37°C, 5 min) and were then seeded onto poly-d-lysine treated coverslips and cultured overnight in 2 mmol/l glucose RPMI (supplemented with 10% [vol./vol.] FCS, 2 mmol/l glutamine and 100 U/ml penicillin/0.1 mg/ml streptomycin). Coverslips were incubated in a physiological salt solution as described above (37°C, 10 min) containing various treatments before being immediately washed with ice-cold PBS and fixed with 4% (vol./vol.) paraformaldehyde for 15 min on ice. Cells were permeabilised for 10 min with 0.5% Triton X-100 before incubation in 0.5 U/ml rhodamine–phalloidin for 30 min to stain actin filaments. Islet beta cells were identified by insulin immunostaining, as described previously . Images of actin staining in beta cells were taken using a Leica TCS SP2 confocal microscope. Numerical data are expressed as means ± SEM. Differences between two groups were analysed by unpaired Student’s t test and differences between several groups were analysed by one-way ANOVA followed by Tukey’s honestly significant differences test. A value of p < 0.05 was considered significant. The endogenous ligand for the GPR54 receptor, kisspeptin, a calcimimetic activator of the calcium-sensing receptor (CaR), A568, the GLP-1 analogue, exendin-4, and the cannabinoid receptor 2 agonist, JWH015, were used in this study to provide a range of receptor-operated secretagogues. Kisspeptin and exendin-4 are reported to have no effect on insulin secretion at sub-stimulatory glucose concentrations [10, 24], observations that were confirmed in the present study (Fig. 1a). JWH015 caused a small but significant stimulation of insulin release at 2 mmol/l glucose (Fig. 1a), again confirming previous reports [23, 25]. While A568 has been previously reported to cause small increases in insulin release at sub-stimulatory glucose in the MIN6 cell line [12, 18], no significant effect of A568 on insulin secretion from mouse islets was observed at 2 mmol/l glucose. All of the secretagogues caused a significant potentiation of insulin release in the presence of 20 mmol/l glucose (Fig. 1c–f), effects that were completely blocked by the presence of the MEK inhibitor PD098059 (50 μmol/l), which prevents the phosphorylation and activation of ERK1/2. Conversely, PD098059 had no significant effect on either basal insulin release or glucose-stimulated insulin release (Fig. 1b). As expected, incubating islets in the presence of 20 mmol/l glucose induced a rapid (5 min) increase in phospho-ERK1/2 compared with those maintained in 2 mmol/l glucose (Fig. 2). However, neither kisspeptin (1 μmol/l) nor JWH015 had any detectable effect on ERK1/2 activation at 2 mmol/l or 20 mmol/l glucose (Fig. 2a, c). Treatment with A568 caused an increase in ERK1/2 phosphorylation at 2 mmol/l glucose, but had no further effect at 20 mmol/l glucose (Fig. 2b). Conversely, exendin-4 caused a small increase in ERK1/2 phosphorylation of approximately 30% in the presence of 20 mmol/l glucose, but did not activate ERK1/2 at a sub-stimulatory glucose concentration (Fig. 2c). Transient transfection of MIN6 beta cells with a constitutively active MEK mutant resulted in significantly increased ERK1/2 activity after 48 h (Fig. 3a, b). Constitutive activation of MEK had no significant effect on basal insulin release at 2 mmol/l glucose or on glucose-stimulated (20 mmol/l) insulin release (data not shown). In control cells A568, exendin-4 and JWH015 had no significant effect on insulin secretion at 2 mmol/l glucose. However, following transfection with constitutively active MEK all of the receptor-operated secretagogues tested caused a significant stimulation of insulin release at 2 mmol/l glucose (Fig. 3c). Kisspeptin was not used for these experiments as it has previously been shown that kisspeptin has inhibitory effects on insulin release in the MIN6 cell line . Okadaic acid and sodium pervanadate inhibit the dephosphorylation of ERK1/2, effectively maintaining both isoforms in their active phosphorylated state, even at sub-stimulatory glucose levels . Okadaic acid and sodium pervanadate (10 μmol/l and 100 μmol/l, respectively) had no significant effect on insulin release at 2 mmol/l glucose, as shown in Fig. 4, but in their presence kisspeptin, A568 and exendin-4 significantly stimulated insulin release at 2 mmol/l glucose (Fig. 4). Similarly, the presence of okadaic acid and sodium pervanadate greatly enhanced the small insulin secretory response induced by JWH015 alone (Fig. 4). Incubation of dispersed beta cells in a buffer containing 20 mmol/l glucose for 10 min caused a significant reduction in rhodamine–phalloidin staining intensity when compared with cells incubated in the presence of 2 mmol/l glucose (Fig. 5a, b), indicating depolymerisation of F-actin filaments close to the inner surface of the plasma membrane. The glucose-induced dissociation of actin filaments was greatly reduced by the presence of the MEK inhibitor PD098059, as shown in Fig. 5c, with beta cells displaying levels of rhodamine–phalloidin staining intensity similar to those of control cells treated with 2 mmol/l glucose (Fig. 5a). Conversely, cells incubated in the presence of okadaic acid and sodium pervanadate at 2 mmol/l glucose displayed reduced levels of rhodamine–phalloidin staining intensity, similar to cells treated with 20 mmol/l glucose (Fig. 5d). Incubation of dispersed islet cells with latrunculin, a natural toxin that inhibits actin polymerisation thus causing the disruption of actin filaments, resulted in an almost complete lack of rhodamine–phalloidin staining in cells incubated at 2 mmol/l glucose, indicating extensive actin depolymerisation (Fig. 5e). The effects of receptor-operated secretagogues on insulin secretion were tested at sub-stimulatory glucose levels in the presence of pharmacological inhibitors of actin polymerisation, latrunculin or cytochalasin B, a mycotoxin that also inhibits actin polymerisation. As in previous experiments (Figs 1, 3, 4) kisspeptin, A568 and exendin-4 had no effect on insulin release at 2 mmol/l glucose, while JWH015 caused a small increase in insulin secretion (Fig. 6). Addition of either cytochalasin B (Fig. 6a) or latrunculin (Fig. 6b) allowed kisspeptin, A568 and exendin-4 to significantly stimulate insulin release at 2 mmol/l glucose and significantly increased the JWH015-induced stimulation of insulin release. An important feature of many receptor-operated secretagogues is that they are capable of only potentiating glucose-induced insulin release, rather than initiating insulin release at sub-stimulatory glucose concentrations. This is a vital physiological mechanism to avoid hypoglycaemia by preventing inappropriate agonist-induced insulin release under normoglycaemic conditions. In the present study, four different G-protein-coupled receptor ligands previously shown to potentiate glucose-induced insulin secretion [10, 12, 18, 23, 27] were chosen to investigate the role of ERK1/2 in receptor-operated insulin release. GPR54, CaR and cannabinoid 2 receptor (CB2R) are all Gq-protein-coupled receptors associated with increased intracellular Ca2+ levels, while GLP-1R is a Gs-protein-coupled receptor associated with increasing intracellular cAMP. 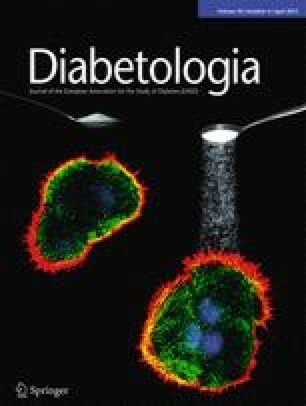 Our experiments using mouse islets showed that kisspeptin, A568 and exendin-4 had no significant effects on insulin secretion at a sub-stimulatory glucose concentration, although the CB2R agonist JWH015 did cause a small stimulation of insulin release at 2 mmol/l glucose, similar to that observed in previous studies in both mouse islets and MIN6 cells [23, 25]. As expected, all the secretagogues used in our study caused a significant potentiation of glucose-induced insulin release at a stimulatory glucose concentration (20 mmol/l). Furthermore, in all cases this potentiation could be completely blocked by co-administration of the MEK inhibitor PD098059, suggesting that these secretagogues require ERK1/2 activation to amplify glucose-induced insulin release. We have previously reported that ERK1/2 inhibition has no effect on glucose-stimulated insulin secretion in static incubation experiments , while other studies have reported conflicting results [8, 9]. However, there is evidence that ERK1/2 may be involved specifically in the first phase of glucose-induced insulin release but not the second phase . This would correlate well with the time course of ERK1/2 phosphorylation in response to glucose, which is primarily within 5 min of glucose administration, and effects on the first phase of glucose-stimulated insulin release may not be apparent in 30 or 60 min static incubations such as those in the present study. Regardless, although the precise role of ERK1/2 in mediating the insulin-releasing effects of glucose is unclear, it is apparent that glucose-induced insulin secretion is not entirely dependent on activation of the MAPK pathway, because even where ERK1/2 inhibition was reported to decrease glucose-induced insulin secretion the inhibition was only partial [8, 9]. In contrast, the receptor-operated secretagogues used in the present study provided evidence for a requirement for ERK1/2 activation to potentiate glucose-induced insulin secretion. Despite this requirement several of the secretagogues tested did not activate ERK1/2. Thus, stimulation with 20 mmol/l glucose caused a large increase in islet ERK1/2 phosphorylation, whereas treatment with kisspeptin or JWH015 had no significant effect at either stimulatory or sub-stimulatory glucose concentrations. Exendin-4 had no effect on ERK1/2 phosphorylation at 2 mmol/l glucose, but did cause a small increase in ERK1/2 phosphorylation at 20 mmol/l glucose, consistent with previous reports , while A568 was the only secretagogue used in this study that caused ERK1/2 phosphorylation at 2 mmol/l glucose. These data indicate that while the receptor-operated secretagogues require ERK1/2 activity in order to potentiate glucose-induced insulin secretion, they have limited ability to activate ERK1/2 themselves, suggesting that ERK1/2 activation is permissive rather than causal for receptor-operated potentiation of insulin secretion. These observations further suggest that glucose-induced ERK1/2 activation is required for the potentiating effects of some receptor-operated secretagogues on insulin secretion, although ERK1/2 activation alone is insufficient to initiate a secretory response [29, 30]. In this model stimulatory concentrations of glucose enhance ERK1/2 activation, thus enabling receptor-operated secretagogues to potentiate glucose-induced insulin secretion. This model also predicts that activation of ERK1/2 at low glucose concentrations will have permissive effects on receptor-operated secretagogues. Transient transfection of MIN6 beta cells with a constitutively active MEK mutant results in increased ERK1/2 phosphorylation after 48 h. While this has no effect on basal or glucose-stimulated insulin release, constitutive MEK activation allows receptor-operated insulin secretion at sub-stimulatory glucose concentrations. The same effect is observed following pharmacological activation of MEK. A combination of okadaic acid, a serine/threonine phosphatase inhibitor, and sodium pervanadate, a tyrosine phosphatase inhibitor, maintains islet ERK1/2 in its phosphorylated activated form [26, 31], but has no direct effect on insulin secretion . We here confirm that pharmacological activation of ERK1/2 with okadaic acid and sodium pervanadate did not stimulate insulin secretion at 2 mmol/l glucose, but also demonstrate that this pharmacological activation of ERK1/2 has glucose-like effects in enabling receptor-operated secretagogues to stimulate insulin secretion. Together, these data are consistent with glucose-induced ERK1/2 activation being a mechanism through which elevated glucose is permissive for receptor-dependent insulin secretory responses. ERK1/2 may play this permissive role through effects on the actin cytoskeleton. It has long been established that actin filaments in beta cells form a cortical band beneath the cell membrane that plays an important role in restricting access of insulin secretory granules to the cell membrane for exocytosis [14, 32]. Pharmacological disruption of this cortical actin web is associated with enhanced insulin release, and several studies have confirmed a link between glucose-induced ERK1/2 activation and actin remodelling [13, 33]. We therefore tested whether the permissive effect of glucose-induced ERK1/2 activation on receptor-operated insulin release involved remodelling of the cortical band of F-actin filaments. At sub-stimulatory glucose concentrations, mouse beta cells contained extensive intense F-actin staining that rapidly depolymerised in the presence of a stimulatory concentration of glucose, confirming previous reports using the MIN6 cells . Glucose-induced actin depolymerisation was substantially inhibited by PD098059, suggesting that in primary beta cells the glucose-induced remodelling of the F-actin web to allow access of secretory vesicles to the cell membrane is mediated, at least in part, by ERK1/2. Pharmacologically induced F-actin depolymerisation using latrunculin or cytochalasin B did not initiate an insulin secretory response but enabled receptor-operated agonists to stimulate insulin secretion at a sub-stimulatory concentration of glucose, in a similar manner to that induced by the pharmacological activation of ERK1/2. Again, these observations suggest that the glucose-induced ERK1/2-dependent effects on actin depolymerisation are permissive for receptor-dependent insulin secretory responses. Our observations in beta cells are similar to those reported in chromaffin cells, in which actin depolymerisation can be blocked by MEK inhibitors, suggesting that ERK1/2 may act upstream of actin remodelling . However, treatment of MIN6 beta cells with latrunculin increases ERK1/2 phosphorylation and potentiates glucose-stimulated insulin secretion, and there is strong evidence that ERK1/2 may also lie downstream of glucose-dependent actin breakdown . These data suggest a potential bi-directional interaction between ERK1/2 and actin polymerisation in beta cells that has yet to be fully characterised. In any event, correlations between the effects of glucose on ERK1/2 activation and actin remodelling have been previously described in the context of glucose-induced insulin release [8, 34, 35]. The present study demonstrates that this interaction between glucose-induced ERK1/2 activation and actin may also play a crucial role in permitting receptor-operated insulin release, although the precise molecular mechanisms involved are uncertain, and may not necessarily be the same as those involved in glucose-induced insulin release. In summary, our data are consistent with glucose-induced ERK1/2 activation in beta cells being a key event in the permissive effects of stimulatory glucose concentrations on receptor-operated insulin secretagogues, at least in part through effects on actin depolymerisation and cytoskeletal remodelling. A full understanding of these events may assist in the development of novel glucose-dependent therapeutic strategies for type 2 diabetes. This work was supported by the Diabetes Research and Wellness Foundation and Diabetes UK (06/0003316 and 07/0003510). All authors were involved in the conception and design of the study. The data were collected, analysed and interpreted by JEB, AC and BL. The article was drafted by JEB and all authors revised the article critically for important intellectual content. All authors gave their final approval of the current version to be published.